Tingling or numbness in the right arm is an annoying condition that affects many people. 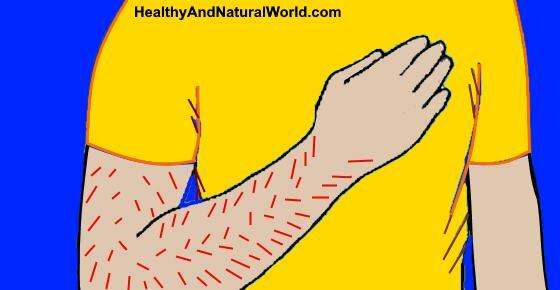 For most people, a prickly sensation or loss of sensation in their right arm is a temporary irritation. Causes of right arm numbness or tingling are usually nothing to worry about. However, a sudden, recurring, or persistent feeling like your skin is crawling or frequent numbness in your right arm could be a sign of something more serious. An abnormal sensation in your right arm could be due to something as simple as falling asleep on your arm, a minor arm injury or poor blood circulation. This can feel like “pins and needles” or it can cause numbness in your whole arm as if your arm has fallen asleep. Sometimes, severe tingling or burning sensations down your right arm could be one of the signs of a cardiac condition that requires prompt medical attention. But usually serious medical conditions that cause tingling or numbness in your arm will be accompanied by other symptoms. Usually, arm tingling or numbness by itself without any other symptoms doesn’t indicate a life-threatening situation. In this article, you will find out the many causes of having “pins and needles” or a sensation of numbness in your right arm. You will also learn how to resolve some of the health issues that cause arm numbness and when you should see a doctor. In general, tingling or numbness down your right arm or your left arm is connected with nerves or blood vessels in your shoulder or arm. If the cause of the right arm tingling is a serious medical condition, you will usually have other associated symptoms like chest pain, difficulty breathing, or severe weakness in the right arm. So, right arm tingling by itself is not usually a sign of any life-threatening condition. If you occasionally suffer from numbness or tingling in your right arm or if you have chronic right arm tingling, here are the various causes of the condition. Waking up without any feeling in your right arm or having pins and needles in your arm is usually due to falling asleep on that arm. Sometimes, falling asleep on a chair can cause your arm to become tingly and numb due to pressing your arm against the arm of the chair. When you wake up, you may feel as if your arm is heavy and weak with no sensation in it. Apart from pressure on the nerves causing paresthesia, poor blood circulation can cause tingling in your right arm or left arm. Sometimes, pressure on the right arm for an extended time can cause reduced blood circulation and tingling will occur as blood begins to flow to the arm freely. There are a number of ways to improve your blood circulation naturally. For example, getting more exercise to boost your heart function, eating healthily to reduce cholesterol, and limiting salt intake all have a positive effect on your circulatory system. Tingling and numbness in the right arm could happen as a result of an injury to your arm or shoulder. Depending on the severity of the injury to your right arm, you may have an abnormal sensation of anything from mild tingling to complete loss of feeling. Some injuries to the nerves in your right arm come from overuse of your hands or repetitive strain injury. An injury to your right shoulder could also result in loss of feeling and severe tingling in your right arm. The American Academy of Orthopaedic Surgeons (AAOS) reports that brachial plexus injuries can result in loss of sensation, numbness, tingling, and feeling like your arm is heavy.7 The brachial plexus is a network of nerves that originate near the neck and shoulder. Brachial plexus injuries can also cause thoracic outlet syndrome which is mentioned below as the next cause. According to the AAOS, the tingling sensation and numbness in your arm should disappear as the nerves heal themselves. If the nerve damage has been severe, your doctor may recommend certain procedures to repair the nerve damage. You can use some natural home remedies to relieve pain while you are recovering from your injury. One popular method is to use rest, ice, compression, and elevation for pain relief – otherwise known as the R.I.C.E. method. Persistent or intermittent tingling in your right arm could be caused by thoracic outlet syndrome (TOS). Thoracic outlet syndrome describes a condition where shoulder nerves get compressed and the abnormal feeling of tingling and numbness travels down your affected arm. One of the causes of thoracic outlet syndrome is cervical rib which is an extra bone that forms above the first rib on the right shoulder or left shoulder. When it presses on nearby nerves and blood vessels, it can cause neck pain, numbness in the arm and other symptoms, which are collectively known as thoracic outlet syndrome. Pinched nerve in your spinal cord can cause numbness and tingling in your right arm. The cervical spine (neck) is housing the spinal cord that sends messages from the brain to control all aspects of the body. If you are diabetic then there is a chance that nerve damage from diabetes can cause numbness and tingling in one or both of your arms. This is called diabetic neuropathy. Depending on the severity of your condition, you may be able to control diabetes by eating a healthy diet. This can help you keep a healthy weight and keep blood sugar levels normal. Also, being physically active, getting proper sleep, getting regular checkups at your doctor can help prevent diabetes. Although heart attack symptoms usually cause pain on the left side of your body, a heart attack can also cause a feeling like your skin is crawling and numbness on your right arm. Sometimes chest pain can be caused by a number of conditions like stress, heartburn, or gas. Because chest pain can be cardiac related, you should always visit your doctor if you have pain that comes on suddenly and that radiates to your right or left arm. Even though your heart is located under your left rib cage, researchers from Harvard Medical say that a heart attack can cause numbness and pain in your right arm or left arm. Along with the arm pain, a heart attack will cause a tight squeezing sensation in your chest, shortness of breath, and possibly nausea and vomiting.13 You may also have other signs of heart attack that you should not ignore. Did you know that around 80% of heart attacks can be avoided by making some simple lifestyle changes? Regular exercise, enjoying a well-balanced diet with plenty of fruits and vegetables, and taking steps to lower your blood pressure can all help to prevent heart disease. Another heart-related condition that can cause tingling in your right arm or left arm is angina. When your heart doesn’t receive enough blood and oxygen as it needs, you can get discomfort in your chest. Angina can become a life-threatening condition and you should visit your doctor if you get chest pains when engaging in physical activity or under stress. Multiple Sclerosis (MS) is a disease of the central nervous system that affects movement, sensation and body functions. Early symptoms of Multiple Sclerosis can affect your left or right arm and cause numbness or tingling. Having a tingling feeling in one arm accompanied by weakness sometimes happens with a stroke. Of course, tingling or numbness in one arm isn’t by itself a sign of a serious condition but it will be accompanied by other symptoms. There are other early warnings of a stroke including loss of vision, loss of balance and coordination, or dizziness. To help lower your risk of suffering a stroke, please read my article on the best life-saving tips for avoiding a stroke. Numbness, itching, and tingling in your right arm or left arm can be caused by a number of other medical causes. Most of the time, right arm numbness or tingling is a passing sensation that is a temporary annoyance. If the reason is due to compressed nerves or blood vessels, the sensation of feeling in your right arm should return when the pressure is relieved. Sudden tingling in your right arm or chronic tingling or numbness can indicate a serious medical condition. Even if you have tingling in your right arm or left arm that comes and goes and there is no discernible cause, you should visit your doctor. WebMD. Tingling in hands and feet. J Man Manip Ther. 2010 Jun; 18(2): 74–83. HealthHarvard. Chest pain: A heart attack or something else? NHS. Generalised anxiety disorder in adults. UMM. Lyme disease and related tick-borne infections. WebMD. Recognize Multiple Sclerosis Symptoms. The National Multiple Sclerosis Society. Numbness or tingling.